On top of that, select models come equipped with the Uconnect system. It adds the SiriusXM Guardian, a Wi-Fi hotspot, and more entertainment and convenience features. 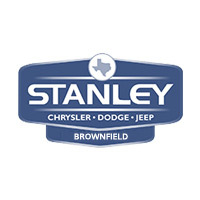 Visit Stanley Chrysler Dodge Jeep Ram Brownfield today to find out why MotorTrend praises the Wrangler for its “on-road ride comfort without sacrificing its vaunted off-road capability.” Before you arrive, be sure to browse our inventory online! The Jeep Wrangler has been a top choice for off-road enthusiasts and critics in Brownfield for years, and the latest model has outdone itself. Contact us to learn more about the whole model line, from the base trim Sport to the legendary Rubicon. You can also speak with a sales associate that’s been trained on the ins-and-outs of the Wrangler by calling (806) 686-4600. Don’t delay! Get prepared for epic adventures outside of Lamesa today.